Next February Marvel Comics (with the help of Disney and Pixar, of course) presents a new Monsters Inc. one-shot full-color comic. In Monster’s Inc.: The Humanween Party, “It’s that time of year again: Humanween! 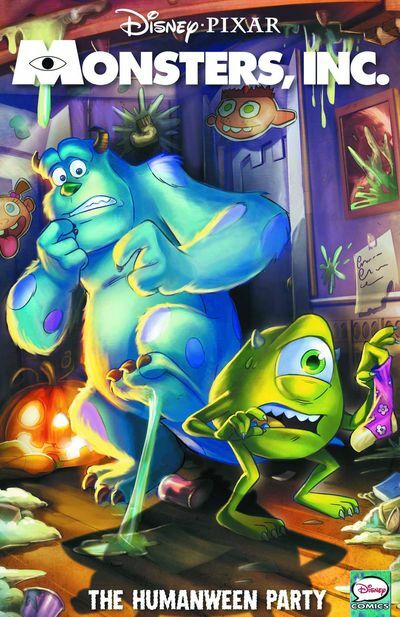 Monstropolis’ version of Halloween – where monsters dress up as humans – comes but once a year, and this time the annual party is at Mike and Sulley’s home. Mike goes into panic mode when he learns of an unplanned visit from his mother the day after the big bash!” It’s written by Alessandro Ferrari and illustrated by Elisabetta Melaranci, Federica Salfo, Michela Frare, and Paco Desiato (whew!). Look for more Monsters Inc. tie-in items in 2013 as the new animated sequel, Monsters University, gets closer. In the meantime, check out Humanween at Things from Another World.